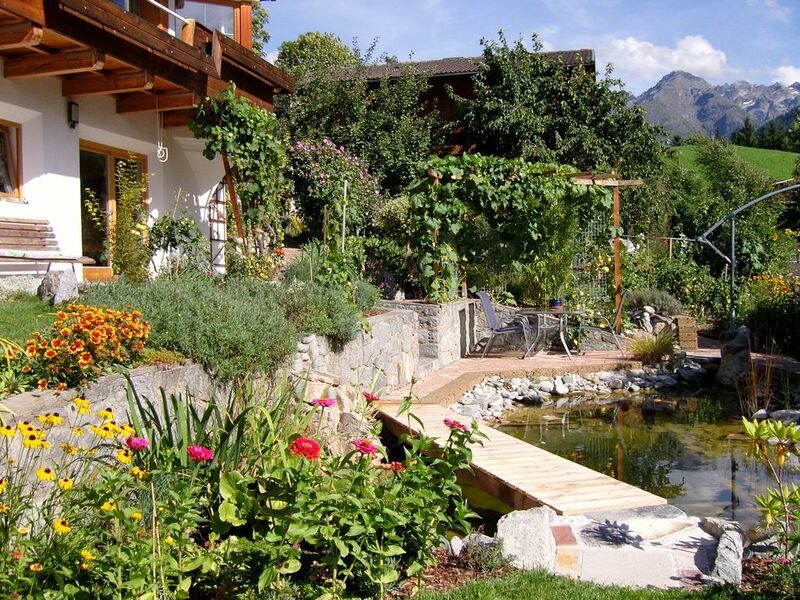 Enjoy your holiday in a breathtaking mountain world in the middle of the nature park Kaunergrat. Our apartment is classified 4 edelweiss - this is the highest classification for apartments in Tyrol. In our house is only one apartment. So you are the only guests and you can enjoy the tranquility in the garden in the Apart Annelies with several seats, as well as on the large terrace at the garden pond all alone. The apartment is modern and equipped with all the comforts of home. Our ideal location makes us the best starting point for a ski safari in the surrounding ski regions such as the Kaunertal Glacier, Serfaus-Fiss-Ladis, Nauders, Ischgl-Samnaun ... Hikers, walkers and art and culture enthusiasts will get their money's worth. The region around the Kaunergrat Nature Park, like the entire Tyrolean Oberland region, has a lot to offer all year round! Come visit us! Summer in Kauns ...: Enjoy your summer holiday in Kauns - in the region of the Kaunergrat Nature Park, there are several hiking and mountain trails - you usually lead from Alpe to Alpe, where you can treat yourself to a Tyrolean Bretteljause and fresh Alpine cheese , Let biologists guide you through the Kaunergrat Nature Park or take a hike to the glacier tongue of the Gepatschferner. In the area of ​​the nature park Kaunergrat there is a lot to discover - butterfly meadows, rare plants and animals, which occur only in this alpine region. Kaunertal is one of the last alpine regions where even ibexes still feel at home. Here, natural and gentle tourism is still very important. Furthermore, you can be carried on the backs of award-winning Tyrolean Haflinger horses over flower meadows or take excursions to the surrounding alpine passes. Enjoy the sun and the view and forget about everyday stress and worries. Kauns ... a winter fairy tale! : Our apartments are the perfect starting point for a ski safari in the surrounding most beautiful and snow-sure ski regions of Tyrol, such as the Kaunertal Glacier, Serfaus-Fiss-Ladis, Nauders, Ischgl-Samnaun, St. Anton etc. No matter if you like fast downhill runs or comfortable and wide slopes. Here is really something for every taste and every ability. Kauns also has a lot to offer away from the ski slopes and is the ideal place to enjoy the holiday away from the big tourist flows. The breathtaking mountain scenery of the Kaunergrat is ideal for exploring and enjoying with cross-country skis, snowshoes or just on foot. Build a snowman in the garden, indulge in beautiful ski slopes or enjoy the panoramic view over the Kaunergrat mulled wine, Jagatee and Brettljause. The Summercard ...: Our guests receive the Summercard free of charge, with this card you can enjoy an extensive offer, mostly for free and partly with reduced prices. For example, free admission to swimming lakes, swimming pools, tennis courts, floor lifts, bowling alleys or free participation in sports and wellness programs such as Nordic walking, bocce and archery. Further included are guided mountain bike tours including bike, guided hikes, and guided tours in the nature park, local history museum and Greiter mill and saw. However, the Summer Card also offers a significant price advantage in rafting, canyoning, tandem paragliding, horse riding, high ropes course, mini golf, mountain railways Fendels and much more. Naturally the children play a central role in the region. And boredom is the last word for them. Therefore, the Summercard also includes a comprehensive children's program (we will be pleased to send you further information on the children's program and summercard). The bathroom is very modern and designed after the model of Hunderwasser. It has a large shower, sink, toilet, hairdryer, towel dryer and a large closet for towels and toiletries. The mirror is big and extra lit. Furthermore, the Apart Annelies has a beautiful large garden with garden pond, many flowers and green areas. Enjoy your breakfast with a sitting area under the grapevines directly at the pond. Street noise does not exist here - Apart Annelies is surrounded by flower meadows and has a great view of the mountains of the Kaunergrat. In the apartment there is also a large hanging shelf with information leaflets of our and all surrounding regions, we also offer our guests city maps (Innsbruck / Landeck) hiking maps, hiking guides, climbing guides and calendar of events from all over Tyrol. Our apartment is a Non smoking apartment - smokers are also welcome, but please smoke outside. Modern, spacious and very comfortable. We loved our stay here. The apartment is equipped with excellent quality appliances and the kitchen has everything you want. The lounge is very comfortable as are the beds. We also enjoyed the private garden. This is a good place to set off on many walks from or within a short drive you have access to many higher walks. It is also a short drive to Italy (Merano), Switzerland, Innsbruck and Germany. Urban Apartment is a modern well equiped apartment with stunning views and feels like home from home. Has all the mod cons you could wish for inclusding satellite TV and wireless internet and more especially a friendly welcome awaits you from your hosts. Ideal for touring round the beautiful Tirol, we enjoyed a week of deep snow and gorgeous blue skies.A very enjoyable stay,hopefully we will return in the summer.